If you’re reading this then you’ve been offered a choice. Hello, my name is ███████████████. I don’t know who you are and I never will. I won’t pretend to know what you’re going through. All I know is what comes next. I’m supposed help you figure out what to do, but I’ve never been much good at giving advice. Instead I’m going to tell you how it was for me. How it worked out. Then it’ll be up to you whether you sign that document in front of you or choose whatever the alternative is in your case. I open my eyes. I must have been napping. The sun is warm on my back and splashes across my shoulders onto the desk. My eyes are drawn to the left side of my desk. The calendar there tells me that it’s Friday and my watch tells me it’s two pm. I check them automatically, without thinking. I usually leave Friday afternoons free to tidy up any loose ends in the hope of getting a whole weekend to myself. I can’t be sure though, so I pick up the phone and dial through to Tiffany. “Ah.” I open my top drawer and pull out the files. “Yes, I have them here. Thank you, Tiffany.” I really need to get a system for this. I turn on the radio. The Boomtown Rats are just getting to the chorus of I Don’t Like Mondays and I hum along. Does any of that sound familiar? Probably. There’s only so many ways to get to where you are now. None of them good. That’s how I got there. You don’t need to know any of that, I guess, but if you know how I got there then maybe it’ll help you understand why I made the decision I did. Whether you want to make that decision too. So you’re probably wondering now; “What happens if I do this? What will it be like?” The honest answer is, I don’t know. Neither will you. I’ll tell you what it’s like but neither of us will ever really know. So let me tell you, then. What it’s like after. I realise I am whispering my thoughts. It happens automatically, without thinking. It ought to, after a month of conditioning to auto-dictate. I recognise his voice. It’s Abrahams. He looks terrible. Old. Worn. I know to expect this but it’s still a little surprising to see how unkind time has been to him. “Thanks for that, pal,” he says. “Time catches up to most of us eventually.” He puts his hand on my shoulder and points at a large house about 200 yards away. “The target’s in there, █████. Go get ‘em.” He’s smiling but there’s something behind it. I know to expect this too. It’s pity. I walk towards the house and behind me The Boomtown Rats fade down to nothing. They are soon replaced by a deep bass thumping coming from the house. I walk through the front door. I am calm. I check for threats. There is a teenager lying on the floor in front of me. He’s unconscious, looks like someone got in a few good shots to his face before applying a chokehold. Judging by the ache in my hands it was me. There’s no one else present. The room I’m in appears to be a reception room in a squat. Dirty mattresses are tossed down all over the otherwise-empty floor. The wallpaper is peeling down in swathes and the whole place reeks of sweat and damp. I can’t see anything that looks like a “Compact Disc” in here, can’t see much of anything interesting. I walk towards the doorway at the back. There are stairs leading up and I can hear that the music is coming from above. I climb up. I am calm. I check for threats. I’m standing in a doorway and there is a teenage girl inside the room at twelve o’clock. She is turning towards me and she has a knife. She’s young, fast. She doesn’t hesitate. I don’t have time to draw my sidearm. She has come straight at me and she’s quicker than I’ve been in thirty years. She’s also clumsy; untrained and glassy-eyed from drugs or something else. I am prepared for this. I have guided her knife-hand wide with my forearm. The knife has struck the doorframe and been twisted from her grip. She has darted back across the room then she runs at me, screaming. I reach out and grasp the hand that is clawing towards my eyes. I pivot and use her momentum to throw her over my shoulder. She flies through the doorway and bounces down the stairs opposite. She comes to an awkward halt halfway down. I can’t afford to leave her behind so I descend to stand over her. Her arm is obviously broken and she seems only partly-conscious. I lift my foot and stamp down on her head with carefully-gauged force. She will likely live. I look down at my hands. My left hand is empty. A card is in the holder on the back of my right hand. It has a picture of a flat, shiny, round object on it and underneath that it says “Compact Disc, music storage.” I climb back up the stairs to the room the girl was waiting in. The music is coming from this room. Something about it tugs at the corner of my consciousness, like someone whispering your name in a darkened room. It is weak, though. It can’t find any purchase on me and slides away. In the corner of the room are a set of enormous speakers hooked up to the smallest stereo systems I have ever seen. I crouch down next to it and look for a way to get the “Compact Disc” out. A tiny button is marked with the eject symbol so I push it. The music dies immediately leaving an echoing silence. A little tray slides out of the stereo system with a shiny object on it. I check it against the card and it looks the same. I pick it up and put it in a padded case from my belt. I take the case in my left hand and look for a way out. I am calm. I check for threats. I am standing in a hallway with what looks like a doorway to the outside at nine o’clock. There are no threats present. I look down at my hands. My left hand is holding a case with the word “objective” printed on it in bold capitals. I turn towards the door to leave the building. There is a noise behind me. I turn to see two teenage boys emerging into the hallway from deeper in the building. One of them is holding a baseball bat and the other a kitchen knife. They seem confused and angry. They rush down the hallway towards me. I have only one free hand so I draw my sidearm. Since I’m shooting one-handed I take my time to line up the shot carefully, to make it count. They get closer. Then I put two rounds into the chest of the first boy. The Webley bucks in my hand drawing my aim high and I fight to lower it towards the second boy. He’s stumbling across his companion’s body and too busy watching his feet to see the revolver draw level with him from five feet away. I fire twice more. One goes in his chest and the other through his neck. He crumbles and skids to a stop on the cracked tiles. Blood spreads out from the two bodies in a broad sheet. I wait, listening, watching. I am shaking with adrenaline. Nothing else moves. I turn and head out of the building. I am calm, I check for threats. There are two men in suits standing at twelve o’clock and three o’clock. They are wearing the badges so I relax and allow the older one to take the case from my left hand. I can hear The Boomtown Rats launching into the second verse of I Don’t Like Mondays so I know I’m not active. The younger one is looking at me strangely, like he’s afraid. I have no way of knowing why. He hesitantly shepherds me into the back of a van. He waits while I strap myself in, offers me the helmet. I settle it over my head, relax in the darkness and hum along to the music. If you’re sitting where you’re sitting, reading what you’re reading then then you used to be a person who did things. Maybe you still are. Some of those things probably weren’t very nice, weren’t things you’d want to talk about even if you could. You did them anyway and you took the therapy and the drugs and the mandatory psychological leave so you could get recertified and get right back to doing them again. You did them because you thought they were important; that they needed to be done. Thing is, you won’t be doing them for much longer, will you? You’re on a clock and it’s counting down, has been for a while. First they put you on “lighter duties,” before you know it you’re desk-bound. And that’s before they found out about whatever got you here. Even if they didn’t know about that, you didn’t have too much longer, did you? That’s what they’re offering you: A chance to keep doing the things that need to be done. It won’t be the same as before. It can’t be. You can’t go back. But it’s something. Maybe it’s enough for you. You’ve got to understand that what they’re offering you isn’t life, but it isn’t death either. Choose wisely. Special Containment Procedures: SCP-2904 is to be stored in the Site-19 Deep-Sigma storage vault at all times except when required for use. When outside of this vault it is to be accompanied by no less than three armed security personnel chosen at random from the standby duty roster. SCP-2904 is not to be handled with bare hands except by MTF Pi-20 personnel as required by their duties. See below for details (classified level 3/2904 / level 4). Unless in active use it is to remain in the secure transport container provided, including while it is in storage. All further testing of SCP-2904 is prohibited by order of the O5 council dated 20/10/1988. Approval for testing on previously-created SCP-2904-1 instances may be sought using standard research request protocols. Description: SCP-2904 is an oblate spheroid with an equatorial radius of 4.982 cm. It is composed of osmium alloyed with 2.3% tungsten, 0.6% iron, 0.4% carbon and 0.3% unidentified exotic matter. Its mass is 10.075 kg ±0.347 kg. This variation in mass is due to the measured mass of SCP-2904 varying according to a sine function with a period equal to the sidereal orbital period of the Earth’s moon (27.3 days). The mass is at its greatest when the moon is aligned with the galactic center as viewed from the Earth. It has not yet been determined what connection, if any exists between the object and the Earth’s moon. There is a 3-mm-deep depression or dimple at one of SCP-2904’s poles. 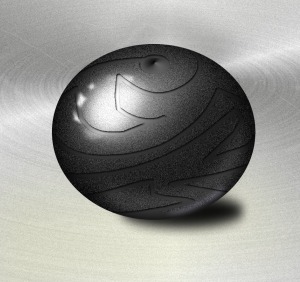 A 1-mm-deep groove or channel extends away from this depression and traces a complex path across the object’s surface. This groove has the anomalous property of beginning and ending at the polar depression without crossing or looping back on itself and only touching the polar depression at a single point. The implication of this is that SCP-2904 is an intrusion into three-dimensional space of a higher-dimensional object. Instances cease ageing. The earliest instances were exposed over 60 years ago (as of 2005) and show no significant changes to their health or physical makeup since exposure. Instances gain a low-level regenerative ability. Tests have shown that a minor (3 cm long, 1cm deep) cut is fully healed without scarring in approximately three days and an amputated limb is fully regrown and functional in approximately eight months. Instances show an enhanced resistance to toxins and disease. Instances do not require food or water but do still require air. Instances suffer from memory difficulties similar to anterograde amnesia. However, unlike most cases of anterograde amnesia, both procedural memory and declarative memory are affected. SCP-2904-1 instances cannot retain new memories or learn via conditioning. Instances demonstrate a significant resistance or outright immunity to many memetic hazards, cognitohazards and related phenomena. These changes are not caused by altered biology as was previously believed, but by an anti-causal effect. Whenever a SCP-2904-1 instance is changed either physically or mentally, it reverts to its state at the time of exposure. For reasons that are poorly understood, the mental reversion occurs on a greatly reduced timescale when compared to the physical reversion. SCP-2904-1 instances have not been documented to be able to retain any new information for periods in excess of 393 seconds. It should be noted that SCP-2904-1 instances can still be killed by most means that would normally kill an entity of their type. The reversion effect continues after death; after sufficient time, life signs return. However, all SCP-2904-1 instances who have died and then returned to life in this manner have thereafter remained in a comatose state from which they cannot be awakened. Recovery: SCP-2904 was recovered in 1935 from a dig site in Jammu and Kashmir, approximately ██ km north of Skardu. This dig site was excavated after information was retrieved from SCP-1726 which indicated that this site was of significance to the Daeva. Unlike other, similar sites that have been excavated, this site contained traces of non-Daeva occupation as well as the expected Daeva artifacts. SCP-2904 was discovered in a partially-collapsed, underground chamber 300 m from the central concentration of recovered artefacts. It was buried in rubble composed of finely-worked stone, badly-corroded copper fragments and iron oxide residue. It is hypothesised that SCP-2904 was part of a larger device or mechanism of unknown purpose. The remains found near SCP-2904 are of a style distinctly different to that typical of Daeva artefacts and are believed to be of non-Daeva origin. This test log is to remain a part of the briefing materials for this object for as long as my wishes hold any sway. I humbly request that my successors keep it for reasons that I hope are self-evident. It is preserved not for its scientific merit but as a cautionary tale. Let those who engage in the scientific method without thought for the consequences of their actions take heed. – Harold Dunelm, Site-19 Assistant Director of Research, June 1943. Subject is one ████████████ of ██████, Idaho. Subject was transferred to the Foundation from federal custody for testing purposes. Subject is introduced to test chamber where SCP-2904 has been placed on a steel table. Subject: So I just have to pick this thing up and run my finger around the groove, yeah? Test Control (via loudspeaker): Yes, that's right. Would you do that please, subject? TC: Relax, this isn't anything like that. You're going to be fine. S: Uh-huh. Let's just get this over with. [Subject picks up SCP-2904 and touches the polar depression] Like this? TC: That’s right. Now follow the groove all the way to the end. S: No problem. [Subject runs a finger along the groove] So far, so good. [Subject reaches the end of the groove] Huh. I really thought that something was going to happen. S: [Subject stops walking and addresses the wall near the loudspeaker.] What's going to happen to me? Am I dying? The guys told me something like this would happen. I should've listened. [Subject paces across the test chamber with his head in his hands, muttering under his breath.]. 2904-1-2 (as the test subject is now known) is still in Foundation custody. As of the date of preparing the updated version of this document, 2904-1-2 has been repeating this pattern with only minor variations for 63 years. — ██████████████, Lead Researcher for SCP-2904, December 2005. Directive A120873 of the Committee for Memetic Hazards, Cognitohazards and Related Phenomena, 12th August, 1973. The formation of Mobile Task Force Pi-20, to be known as “The Oathkeepers” is this day ordered by the authority vested in this committee by the O5 Council. The creation of this new task force is pursuant to the aims and objectives of this committee, to wit; providing the Foundation with the tools, protocols, methods and knowledge with which to counter the increasing menace of memetic hazards, cognitohazards and other related phenomena. This committee hereby appoints Dr. Geoffrey Cobholm, currently serving as Assistant Scientific Advisor to this committee, as the commander of this new task force. Dr. Cobholm is given full authority to make such requisitions of personnel and materiel as are necessary to bring Mobile Task Force Pi-20 into a state of operational readiness in as short a timeframe as is practicable. Twenty Operators who will provide the primary operational capacity of this task force. Operators will be exposed to SCP-2904 which will confer a high degree of resistance or immunity to a wide variety of memetic hazards, cognitohazards and related phenomena. Operator candidates are to be selected only from Foundation field operations personnel who have been diagnosed with dementia or a similar condition such that their quality of life can be expected to be improved by this assignment. See document 2904-B-12 for further details regarding Operator selection and preparation. Such support and management personnel as are necessary to enable the Operators to carry out their assignments. These personnel are to be recruited from the ranks of the Foundation’s existing support and field operations personnel wherever possible, or where necessary, from approved partner organisations. This directive is to be distributed to all level 4 personnel using the Foundation Secure Bulletin Service. Further information regarding protocols for identifying situations requiring the intervention of this task force, for requesting such intervention and for setting up information conduits to and from this task force will be provided in later communications. Report F011114c, Operational Oversight MTF Pi-20, 1st November 2014. This document is the executive summary of report F011114. It contains background material relating to an incident involving MTF Pi-20 Operator #7 during a sanctioned mission on 12th September 2014. It also contains an overview of the results of the investigation into that incident. For full details please consult report F011114. All is serene. Situation check; there is no movement nearby, green for danger. I am in a large, industrial room filled with control panels and glowing displays showing a complicated web of blinking lights. There are screens showing a swirling pattern of colours, like a shoal of rainbow-hued fish. It makes me dizzy. I turn away. I feel better now. I look down at my left hand. It's empty. I look at my right hand. There is a tiny screen on the back of my glove. It shows a picture of a control panel. I look around. The picture matches one of the panels opposite the door. I move over to it and look down. There is an array of switches, sliders and typewriter keytops. Time to get further instructions. I raise my voice from the continual murmur of my auto-dictation "Control, this is Operator seven, I have reached the objective. Please advise, over." I reach into the pouch on the left side of my chest. I pull out a handful of fragments of plastic and metal. It looks like it used to be a cylinder about the size of my thumb. "Control, we have a problem with the package. It's been destroyed, over." There is the loud crump of a grenade going off in the corridor outside, followed immediately by screams. I must've set a trip-wire trap. Judging by the swearing mixed in to the screams it didn't get them all. I take a firing position behind a control panel. A man and a woman dressed in tactical gear rush through the open door and look around. They notice me and start to turn their weapons towards me. They are too slow. I fire a three-round burst and the man falls. Clean hits to the chest. The woman fires. She has not aimed carefully. Bullets slam into the control panel I’m crouched behind and sizzle past me. I hunch down behind cover, keep my head down. She’s firing on full-auto so I pause a second while the recoil pulls her weapon up. The bullets start tearing up the ceiling. I don’t give her time to recover her aim. I pop up and put a burst into the center of her chest. She drops. I line up on the doorway and wait; one, two, three, four five. Nothing. I ease out of cover and move over to the door, glance up and down the beige-carpeted corridor. There are three bodies, one of them still moving weakly. The blood collecting under him says not for long. I check the two people I’ve just shot and find they’re both still breathing. Their body-armour took the hits. I take a deep breath. I finish them both off. I don’t like it but it has to be done. I stand and breathe, letting myself relax. All is serene. Situation check; there is no movement nearby but there are two corpses at my feet and my weapon has recently been discharged, amber for danger. I am in a good-sized, industrial room filled with control panels and huge display panels showing an array of flashing lights. There are bullet-holes scattered about and several screens and displays are damaged. The remaining screens show a moving pattern of colours, like broken shards of a rainbow falling. It makes my head spin. I look at the floor. I feel better. "One second, Control." I check my right hand. There is a tiny screen showing a picture of a control panel. That one. I move over to it. "Control, I am at the objective. What do I need to do, over?" I reach over my shoulder and unfasten the array from its pouch. I take the tangle of wires and plastic boxes and hold it. "I have it, Control, over." "I see a green cable. Which end is the backup module, Control, over?" "Uh-huh. I have disconnected the green cable from the backup module. What do I do with it, over?" “If you look at the back of the control panel you should see a connection point that matches the green cable, over." I crouch behind the control panel. I see a mess of cabling entering and leaving the machine. There are too many to count. "Control, I don’t know where this goes. I'm going to need a little more help, over." “Right, okay, Operator. There should be a USB hub tucked in there… a small plastic rectangle with lots of cables connecting it to the control panel. Look for an empty socket there, over." I look. Everything is rectangular. Everything is plastic. All is serene. Aaah… it hurts. Situation. Check. My eyes won’t focus. I feel cold, red for danger. I’m in, inside? I’m lying on the floor. The floor is wet. I am injured and bleeding out. I roll onto my back and reach for the first aid kit on my belt. My right arm is numb. I reach awkwardly across with my left and… ahhh. I nearly passed out again. I open the kit one-handed. Bandages and dressings have rolled out onto the floor. There is a shadow standing over me. I hope it’s a friendly. Operator #7 appears to have died at this point. As a result of this loss the mission was deemed a failure. Regular forces were sent in and managed to clear out the attackers, although with unacceptably high casualties. The as-yet unidentified attackers had managed to insert a cognitohazardous image into the electricity grid control station’s office network which was then shown on monitors throughout the facility. This image rendered nearly the entire staff unconscious with a small number of fatalities. The attackers were then able to enter the facility unopposed and divert power from the entire G4 grid of Chicago to a single, rural substation for six hours. It is currently unknown what purpose this served. The oversight committee has determined that neither Operator #7 nor her handlers, Agents Gail Ipupa and Cameron King are to blame for the incident that occurred. They all acted in an exemplary manner. However; it has been determined that Operator #7’s inability to deal with modern technology was a significant contributory factor to the negative outcome. This inability is through no fault of her own but is inherent to the process used to treat her in preparation for her role in the task force. It is the recommendation of this committee that a review of MTF Pi-20 be carried out at the highest levels. It should be considered if there is a place for MTF Pi-20 in its current form in today’s Foundation and how best to decommission redundant Operators. Memorandum from the office of the Revd Dr. Justine Urchadainn , Commander MTF Pi-20, December 21st, 2014. It is with a heavy heart that I write to inform you that I will be stepping down as commander of this task force. I have nothing but respect for the men and women of the Oathkeepers. I am proud to have served alongside and led such dedicated and professional colleagues. My time with you has taught me much about what it means to serve and what it means to sacrifice. I hope those lessons serve me well in my future career. I know that many of you have expressed concern about our Operators’ futures. They become hampered by their inability to understand or operate in what is to them, an increasingly-alien world. Unable to learn or change, they become obsolete, outdated and gradually become operational liabilities. After the recent incident it has been decided to retire the longest-serving of them. Please be assured that I am bringing to bear the full weight of my political power within the Foundation to ensure the honourable treatment of those of our Operators who are to be retired from active service. These are men and women who gave their lives to this organisation and then, when asked for more gave with both hands, holding back nothing for themselves. They are not test subjects nor anomalous objects nor broken machines but the bravest among us. They are exemplars of what is best in the Foundation and I will not allow them to be treated with anything less than the greatest respect. Though they neither need nor ask for anything more than their music and a comfortable place to sit they will have those and every comfort we can provide them. The Operators may not remember what they have done for us and for the world, but we will remember for them.